An aerial photograph is a picture of the Earth’s surface taken with a specialized camera mounted in an airplane. Millions of dollars are spent each year by local, regional, state, tribal, and federal government agencies, as well as private companies, to collect aerial photography over the United States. Most online mapping sites such as Google Maps and Bing Maps now display aerial photography along with traditional highway maps. These sites provide a quick and easy way to view air photos online. Google Earth, a tool you can download and install on your computer, is another easy way to view worldwide aerial photography and satellite imagery. Google Maps and Bing Maps (and other similar sites) are very useful, but there are limitations. First, printing is limited to relatively low-quality web pages. In addition, the photography can sometimes be old and outdated in rural areas. And finally, the date(s) of the aerial photography available on these sites is often unknown. As a general rule, local government agencies in Wisconsin typically acquire new aerial photography every five years. More urbanized and quickly-developing municipalities may acquire new aerial photography as often as every 2-3 years. A statewide flight was conducted by the U.S. Department of Agriculture during the summer of 2017. This was in addition to a large number of counties that acquired new aerial photography in the spring of 2015. First, some background: people in the mapping industry commonly refer to the “resolution” of an aerial photograph. For example, a 3-inch resolution aerial photograph means each pixel in the image represents three inches on the ground. Aerial photography in Wisconsin is most commonly collected at 6-inch or 12-inch resolutions… enough detail to see lines painted on roads. Nearly all aerial photography today is collected digitally, meaning the end product is a digital photograph that can be used and manipulated on a computer. Aerial photography from the 2017 summer project (called the National Agriculture Imagery Program or “NAIP”) is available as a free download from the WisconsinView.org Web site. Use this photography if you are looking for a colorful image covering a large area. NAIP has a relatively low resolution of one meter, which means individual houses will become very blurry if you zoom in on the image. If you need the most detailed aerial photography for a small area (e.g., a single farm or neighborhood), photographs from the spring 2015 county flights are the most appropriate choice. The spring 2015 photographs have a resolution of anywhere from three inches to 12 inches, depending on the county. These high-resolution photographs are currently available through individual Wisconsin counties. Start with a County Web Mapping site, or contact the Land Information Officer (LIO) in your area of interest. Finally, if you want a moderately high-resolution photograph for a larger area, such as an entire city, you can download 18-inch resolution digital aerial photographs from the WisconsinView Web site for free. These images were acquired during the spring of 2010, so they are generally not as colorful as the summer 2017 “NAIP” photographs. 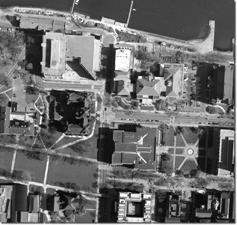 State and federal agencies began acquiring widespread aerial photography over Wisconsin in the 1930’s. To view and download 1930’s-era aerial photography for the state, check out the Wisconsin Historic Aerial Image Finder (“WHAIFinder”). If you are looking for photography acquired between the 1930’s to the present, visit our Wisconsin Aerial Photography Catalog. If you are having trouble locating aerial photography in Wisconsin or need further help, please contact us via e-Mail or at (608) 262-3065.